This is the Big North Conference opener for both teams, as Petoskey begins defense of its league title. The Northmen have come to be known for a plodding but brutally efficient ,multi-back running game under coach Kerry VanOrman, and their 2012 edition looks no different. In their 21-0 season opening win against Sault Ste. Marie, senior Chase Ledingham ran for 155 yards and two TDs while Kurt Boucher, just a sophomore, had 71 yards and a score of his own. Directing the attack for Petoskey is senior Quinn Ameel, a returnee at QB. Petoskey’s defense was the real star, though, standing stout to shut out the Sault while holding them to five first downs and under 100 yards of total offense. That can’t be particularly reassuring news to Ogemaw Heights, which lost last season to P-town 56-7. That was Ogemaw’s first-ever Big North game, however, and this should be a more battle-tested unit. Aside from the Petoskey loss, offense wasn’t the problem last year for the Falcons and it could again be a potent unit thanks in no small part to three college prospects — senior running back Brandon Bermac, senior receiver Jerome Hunter and one of the top junior linemen in Michigan, 6-5, 265 Alec Stevens. Ogemaw Heights beat Standish-Sterling last week 38-20. Bermac ran for 156 yards and two TDs and Hunter had 102 receiving yards and a TD. To clear up any confusion, going forward these are the leagues and schools we’ll be covering. Stokes is ably picking up for Kevin Vicari, who was a utility all-state player and is now at Grand Valley State. When you dominate East Grand Rapids on all three units, you’re legit. In CC’s 33-14 win, Stokes twice intercepted the Pioneers, blocked a punt, and ran for a 53-yard score. He’ll be a big-time rankings mover at this rate. Westside stand up. Orchard Lake St. Mary’s found out that the real Big Red certainly isn’t their garish home turf. Finley shut it down inside, keying a yeoman line effort that sent Orchard Lake St. Mary’s in defeat back to Oakland County. And that puddle they dare call a lake. Kenowa Hills had four junior standouts on defense. But Evans was on a level of his own, with his motor going both ways, ears down big play ability and terrific 11th-grade frame. This category covers players whose performance warrants a shot at the next 2013 player rankings. Matthew Hall, a 6-0, 210 Grand Rapids Christian senior, is a playmaker for the Eagles’ D at middle linebacker. He led them with nine tackles in their win against South Christian and returned a fumble for a TD. He did the same thing last year against Northview. Hall will hit to cause fumbles, too, and is a consistent threat to break through into the offensive backfield. A typical effort from Hall Saturday at Cincinnati Moeller will go a long way towards helping the Eagles’ compete. Two sophomores are already impact quarterbacks. Grand Rapids Christian came into the season a consensus top 10 pick and a roster double-digit deep with college prospects. All South Christian’s 6-2, 180 soph QB Jon Wassink did in his high school debut, a 10-point losing cause agaisnt the Eagles, was complete 12-of-24 throws for 227 yards and three TDS, while running for 145 and another TD. “He didn’t make a bad decision … he never forced the ball anywhere,” South Christan coach Mark Tamminga said. Tyree Jackson is already a second-year starter for Muskegon Mona Shores. The 6-0, 165 sophomore loves the long ball, but Mona didn’t really need it in a 42-6 dismantling of injury-ravaged Muskegon Catholic Central. *In Kingsley’s 18-0 win over Traverse City St. Francis, the Stags’ defense held the Gladiators to 78 yards of total offense, and no first down in the second half. *Junior lineman Kenneth Finley forced a fumble in the end zone spearheaded a Muskegon defense that held Orchard Lake St. Mary’s to under 100 yards rushing and seven first downs in the Big Reds’ 21-14 victory. *Zeeland East topped Holland Christian 64-28. Josh Blauwkamp ran for 239 yards and two TDs, Spencer Viening 160 yards and four TDs. One of the Lake’s coverage area’s top junior receivers, Kyle Steigenga, scored all four of Holland Christian’s touchdowns. Maroons QB Ross Schreur threw for 356 yards. *Chase Ledingham rushed 154 yards and two TDs for Petoskey, a 21-0 winner at Sault Ste. Marie. *Forest Hills Central junior QB Justin Chopp went 20-of-28 for 329 yards and five TDs in a 59-58 shootout win over Zeeland West. 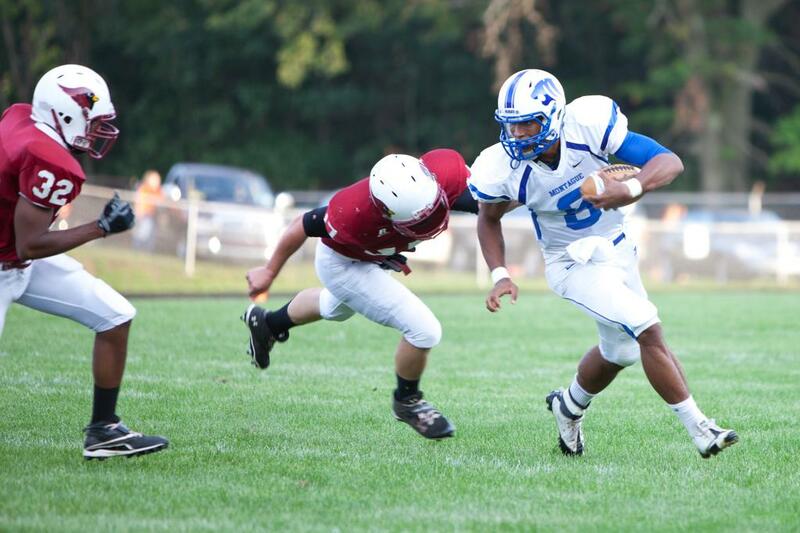 *Niles Brandywine senior Courtlan Gordon had 209 yards and four TDs on the ground in a 40-6 rout of Lawrence. *It came in a losing cause to Grand Rapids Christian, but the debut of South Christian sophomore QB Jon Wassink served notice that he’ll be a force for three years to come. Wassink threw for 227 yards and three TDs and ran for 145 and another score. With only one offensive starter — third-year center Matt Mulcahy — back from a record-setting 2011, no one was expecting Grand Haven to put up 30 in their season opener. It took awhile for quarterback Michael Penland to find a rhythm in his first varsity start, but the 6-3, 180 senior discovered it at the right time. He led the Buccaneers on a 64-yard drive in the game’s closing minutes, ultimately connecting with senior Jake Lovett for a 17-14 win over Traverse City Central, Friday at Grand Haven. TC Central missed a 46-yard field goal attempt in the closing seconds. *Grand Haven’s Isaak Newhouse, a 6-0, 185 junior, has been labeled the heir apparent to all-state receiver Danny Cotter, now at Butler. He caught one touchdown, but in this game Newhouse’s major impact came on the defensive side. He straight out yanked away a TD pass from the hands of a TC Central receiver late in the first half. Earlier, he showed off his tackling skills by stoning one-on-one TJ Schepperly, the Trojans’ shifty senior QB. Offensively, Newhouse got a good break off the line and showed requisite straight-line speed for the position. *The breakout player for Traverse City Central was 6-3, 210 outside linebacker Mitchell Wynkoop. You won’t find this junior on any recruiting charts now, but that will change. He twice stopped Grand Haven running backs behind the line of scrimmage, and in the third quarter laid a hit on Penland that resulted in an interception. Wynkoop was strong in coverage against the Bucs’ tight end, 6-4, 215 senior Anthony Perrier, but was a bit stiff and upright dropping back with wide receivers. That said, no passes were completed on him. *In his quarterback debut, Penland finished 14-of-31 passing for 184 yards. The man getting him the ball, Mulcahy, is a smart, tough two-way player at 5-11, 210. In addition to his duties at center, from linebacker he led Grand Haven with 10 tackles. *6-7, 280 senior Tyler Gildersleeve was impressive at right tackle for Traverse City Central. He has an explosive lower body and good reach. Rare for the O-K Red, Grand Haven is a finesse team and had no one who could physically match up with Gildersleeve, and despite his lack of upper body strength he repeatedly mauled them in the running game. Liked how he always kept the legs churning. Right tackle is a good fit for Gildersleeve, as he doesn’t have the nimble feet for the left side. With improved strength and awareness in the passing game, and he could go MAC on signing day. *Schepperly makes good things happen with his legs. He’s be even more dangerous if the Trojans had a power running game to set up his jaunts around the end, but he made do. At 5-8, 175, quarterback is obviously not his natural position, but he’s a tough, rah-rah, team-first type who can rally his guys and get them going. TJ looked good on punt returns, which could be his ticket to the next level. Kenowa Hills scored the game-winning TD, a 17-yard bullet over the middle from Cody Ritsema to fellow senior Dylan Smith, with 1 minute 16 seconds to play, giving the Knights a 16-12 opening night victory over Traverse City West. That score erased West’s first lead, which came on a TD plunge from junior Grant Balino less than 90 seconds previous, set up by a 39-yard run by Titans freshman Grant Ellison. He had a number of big gains, his high school debut made all the easier by the presence of a future Division 1 guard, Connor Hayes, partnering well with junior center Wilson Unke in consistently opening fullback-sized holes. Already with offers from CMU, Indiana, Syracuse and WMU, Hayes continues TC West’s streak of offensive linemen that includes Oregon sophomore tackle Jake Fisher and former U-M center Rocko Khoury. Hayes doesn’t immediately wow you physically quite like Fisher. In Game of Thrones parlance, if Fisher is the Mountain That Rides, then Connor is younger brother The Hound — still a renowned killer. There’s little doubting Hayes’ strength for the position. When the 6-3, 292 junior made contact, Kenowa had no push on the interior. One he locked on, it was Hayes doing the moving, helping West pile up 422 yards of offense, 365 of it on the ground. Generally kept his hands inside, other than once when he just tackled a Kenowa defender (no flag). The only time he was clearly beat, it was just an old-fashioned whiff. Would like to see him get lower when run blocking. Hayes’ feet and speed were solid, as a couple times he reached his second blocking assignment. In addition to his four offers, he’s being recruited by Michigan, Michigan State and Minnesota. *Connor Hayes came into the game as The Lake Michigan Football Report’s No. 6 2014 prospect. On the other side of the ball, 6-2, 240 Kenowa Hills junior Zach Evans checks in at No. 20. If he plays like this the rest of the season, that’s probably too low. This is his first year playing with a hand down. He started at right defensive end and right offensive tackle, and rarely left the field. He moved well in space, got off the line quickly, but can stand to get stronger to free himself from traffic. He had three sacks. On the second one Evans came in untouched from the blind side, forcing a fumble from West senior QB Donny Cizek. 6-2, 200 junior Travis Breuker started on the other end and had a play-making knack himself. 6-0, 195 junior linebacker Chase Dunneback led the team with 12 tackles. 6-3, 180 junior Josh Fransted has good safety size and sealed the deal with a late interception. These four are clearly a defensive group to follow the next two seasons. *West’s top senior prospect is linebacker Derrick Diver. The GLIAC likes him, with good reason. Diver isn’t an explosive hitter, but he’s a smart, smooth read-shed-and-wrap guy with terrific size at 6-3, 218 and sub 5.0 40 speed. Diver was credited with eight tackles and recovered a fourth-quarter fumble that led to the Titans’ go-ahead score. *Kenowa Hills dominated the special teams play. Senior kicker Vinner Mendez put all three of his kickoffs into the end zone and put through both PAT. West didn’t convert on three two-point attempts (the “successful” one nullified by a 15-yard chop block) and gave the Knights an early 2-0 lead when a West snap went over the punter’s head into the end zone. *Traverse City West’s underclassman talent was impressive. Ellison is the starter at fullback as a 6-0, 175 freshman. 6-1, 180 sophomores Zack McGuire was good in cover situations, moving well for his size and age with 4.7 40 speed. The Titans’ top young prospect, one who is expected to succeed Hayes in the offensive line tradition, is still on the JV, 6-4, 270 freshman Thiyo Lukusa. *He wasn’t featured until the two minute drill, but Kenowa Hills’ 6-1, 180 senior receiver Dylan Smith could be a solid small college prospect. *Wilson Unke played well at center for West, but unfortunately was carted off the field late in the game with a leg injury.